Why do Western Digital hard drive power supplies leak so much AC voltage? We recently changed out a case on a computer power supply. The new case is metal whereas the old one was plastic, and as I was plugging in a USB cable from a USB hub I got a shock. Not only that, when I accidentally touched it to the bottom of the computer’s case, the computer power supply completely shut down and would not restart until I physically removed the power cord and plugged it back in. Since this hub had worked just fine with the old case, it led me to wonder what the issue was. 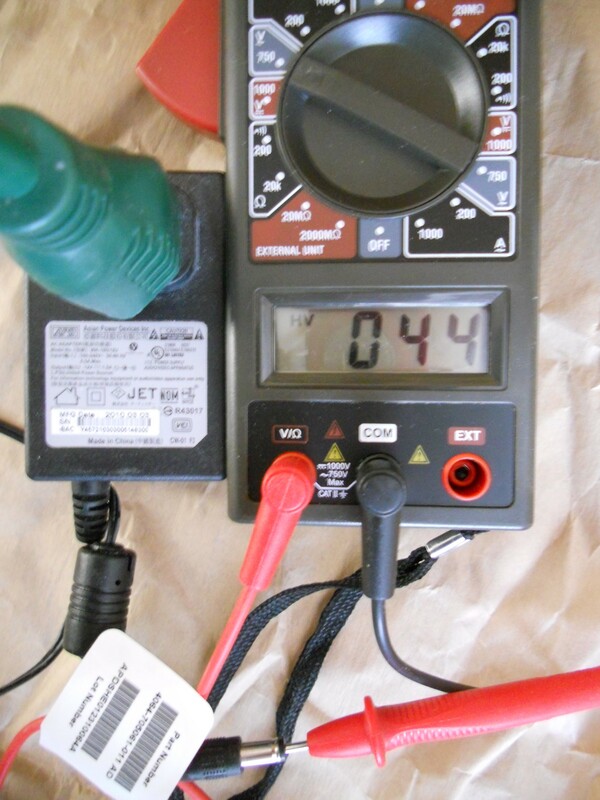 I put a voltmeter on the shell of the USB cable and measured about 50 volts AC to ground! To make a long story short, I have four external USB drives plugged into that hub and they are all Western Digital. Every single external hard drive had AC voltage on its USB cable shell (when disconnected from the hub), whereas no other devices had more than a volt or two. That led me to disconnect the power supplies from each of the hard drives, at which point I made a, um, shocking discovery! 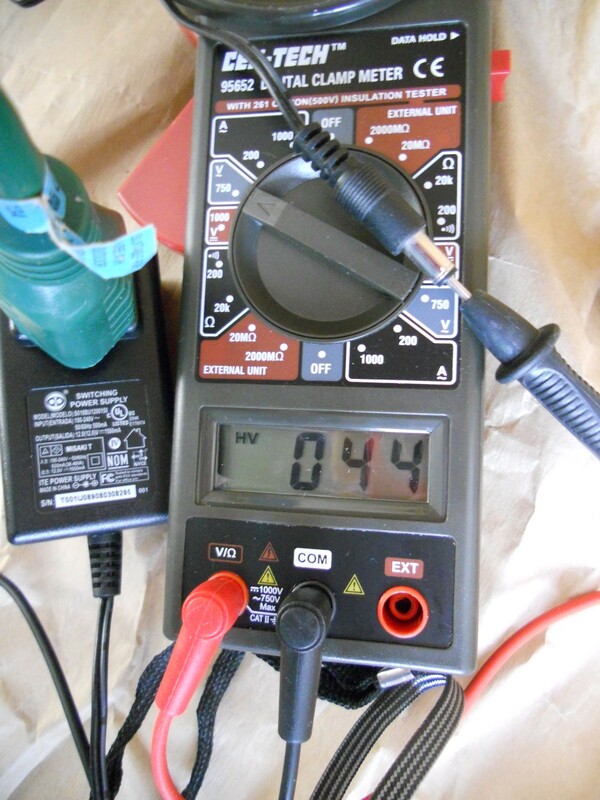 I measured the voltage from the power supply DC plugs to ground. For this test I plugged them into an outlet on a totally different circuit from the one I plug my computers into, since a friend has suggested that the outlets might be miswired (hot and neutral reversed). I tested for that possibility and that was not the case, but it was still easier to take them out to the kitchen for this test. I photographed the results for three of them but a fourth gave similar results. I’m sorry that the pictures are a bit blurry but if I’d used flash it would have washed out the LED display so the exposure times were a bit longer than I would have liked, given that my hand isn’t all that steady. EDIT: For a few hours after I first posted this, I had image #1 duplicated as #3. Sorry about that. It didn’t matter which way the AC plug was inserted into the socket – the voltage was the same or very nearly the same (within a couple of volts) either way. It didn’t matter whether I measured to the center or the shell of the DC plug – the voltage was exactly the same either way (this makes me think the leakage might be through a capacitor or capacitors, since otherwise there would be a DC short). Whatever voltage I measured at the power supply found its way to the USB plug shell once the power supply was connected to the hard drive. I measured this on FOUR different power supplies, all ones that came with Western Digital hard drives of various sizes. On three I got the 44 volt reading and on one I got 57 volts. If it were just one or two power supplies doing this, I’d suspect a flaw in that power supply. But since every single one of them is doing it, I have to think it is something inherent in the design of the switching power supplies used with external hard drives. For some reason this never caused any problem with my old computer or case but this new one (new case) can get really strange if you connect or disconnect the USB hub while it is running and the power cable is connected. I just hate the fact that there is this much stray AC but it must be a problem specific to the hard drive power supplies so I don’t think there is anything I can do about it. I don’t know of any way to correct this problem, or even if it really is a problem. But I REALLY don’t like it! By the way, I don’t mean to impugn Western Digital specifically, it’s just that right now all four of the external drives connected to this particular computer are WD’s. I do NOT know whether or not this problem affects power supplies that come with other makes of hard drives (if anyone wants to test yours and post the results in a comment, I’d appreciate it, but please don’t unless you have worked with electricity enough to know how to do the test safely, since I will not be responsible if you fry yourself or your equipment because you didn’t know how to do the test!). 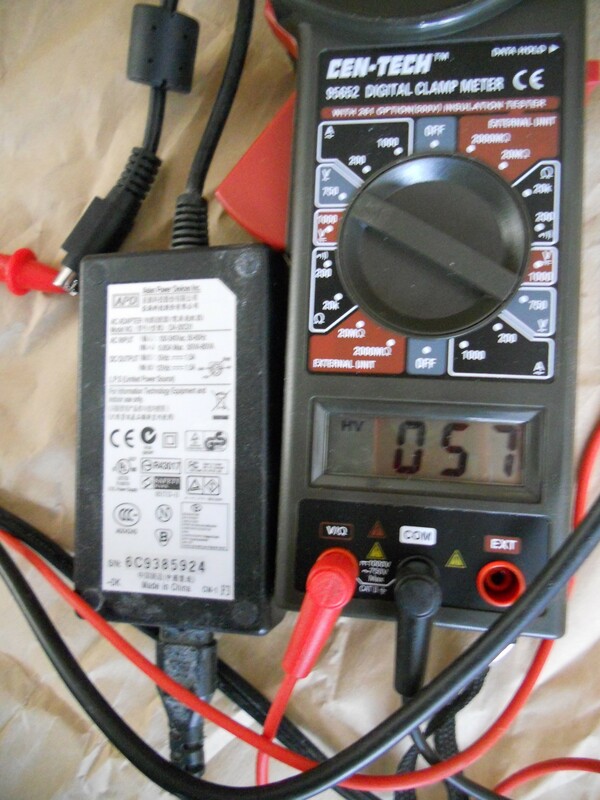 Posted in consumer, electronics, hardwareTagged Alternating current, Electronics and Electrical, external hard drive, Power Supplies, Power supply, Western Digital2 Comments on Why do Western Digital hard drive power supplies leak so much AC voltage?